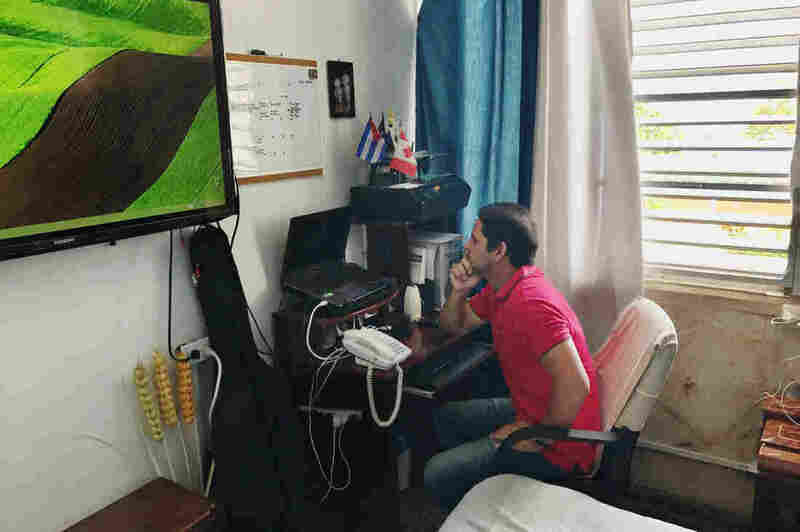 In Cuba, Growing Numbers Of Bloggers Manage To Operate In A Vulnerable Gray Area : Parallels Their work on politics, music and local issues is tolerated by the state, but can still be censored or shut down. "They are committed to expressing themselves through this format," says a Cuba expert. Harold Cardenas Lema runs the blog La Joven Cuba out of the two-room apartment he shares with his mom and girlfriend. In recent years, a growing number of news and political websites have popped up in Cuba. Some are taking advantage of what they say has been a small but vibrant opening afforded them since former President Obama reestablished U.S. relations with Cuba. But others worry that President Trump's harder line toward the Communist Castro government could have a chilling effect on the independent media movement afoot. Harold Cardenas Lema runs his blog La Joven Cuba, The Young Cuba, out of the two-room apartment he shares with his mom and girlfriend in a dilapidated building just blocks from Havana's oceanfront esplanade, the Malecon. "It's really just one-and-a-half, actually. This is a very small, a very small apartment," he says, laughing. All editorial board meetings take place in his bedroom, with everyone sitting on his bed. Despite its mundane office, discussions on Cardenas' seven-year-old blog are anything but boring. And they are popular. He says the blog gets about 2,000 unique visitors a day, nearly 70 percent coming from inside Cuba. That's quite a following, given how expensive and difficult it is to access the Internet on the island. Exact numbers on Cuba's Internet access are hard to pin down. Freedom House, a U.S.-based human rights group, estimates that anywhere between 5 percent and 30 percent of the population has access, one of the lowest levels of Internet penetration in the world. Most Cubans connect via spotty public WiFi hotspots, mostly in parks and near tourist hotels, for about $2 an hour. Many websites, whether they originate on or off the island, are officially blocked. In a recent post titled "Papa Estado," Father State, Cardenas opened a discussion about whether it was right for the Cuban government to control all aspects of private life on the island. Among the questions raised: If Cuban baseball players pay taxes, why can't they hire their own agents? And for tax-paying small business owners, why can't they import much needed goods? Surprised by the boldness of the topic, I ask Cardenas how it is that he can criticize the government so openly on the Internet in Cuba. He says there's more freedom of speech in recent years than outsiders might assume. "There is this [misconception] that you cannot do that in Cuba — it is pretty much a prejudice of people that don't know how Cuba works," he says. And he puts President Trump, who recently announced new restrictions for Americans traveling to the island, at the top of that list. He says in the past seven years that he's run the blog, he's never been told to remove a post or been detained by security forces — though he does say he has on occasion been "misunderstood" and called "to task" by officials about certain articles. He doesn't elaborate on either of those circumstances. In fact, Cardenas says since President Obama improved relations with Cuba in December 2014, he has had more freedom than ever to criticize his government. It's a small but important opening he fears will inevitably close, given Trump's harder line toward the island. "If Donald Trump really wants to end the Cuban government," he says, "he is not doing a very good job." As the past has shown, Carendas says, when the U.S. clamps down on Cuba, everyone goes on the defensive and is less open to self reflection — even those who push for wider debate and criticism about conditions at home. "We work better and we are a better country to deal with the many things we have to solve here when we don't have the pressure of the biggest country, the most powerful country in the world," he says. Cuba's state apparatus does control news and information on the island, but some independent writers and reporters are breaking through and even providing unfiltered international and local news these days. The best known is 14ymedio, an internationally celebrated site started nearly a decade ago by Yoani Sanchez. But others are breaking through. One site, Periodismo del Barrio, run by journalist Elaine Diaz, chronicles local happenings in some of Cuba's poorest neighborhoods. And Cuba Profunda, run by Gisele Morales, a local reporter out of Sancti Spiritus, gives a glimpse of life outside of Havana and into the provinces. Robin Pedraja runs the Vistar music magazine in Havana. Recent articles in some of these blogs have tackled local problems — everything form debilitating water rationing to cheating on state university entrance exams. And many have successfully lobbied the government for fixes. According to one blogger, the government changed the state exam after the cheating scandal was exposed — a rare reversal for Cuba's state apparatus. Ted Piccone of the Brookings Institution says these Cuban new media journalists are working in a vulnerable gray area. They are tolerated by the state but not working with official authorization, either — and not without threat of censorship or shutdown. "The government has sent agents to shut them down or interfere with their work," Piccone says. "Nonetheless, they are smart, well-educated, well-trained professionals in Cuba. And they are committed to expressing themselves through this format." While the Castro regime may be giving a slight opening to younger Cubans exploiting new media, it continues to crack down on the island's older dissidents, who've long protested bans on public gathering and freedom of expression. And not all of Cuba's young media professionals are willing to test the limits of Cuban openness through politics and opinion. 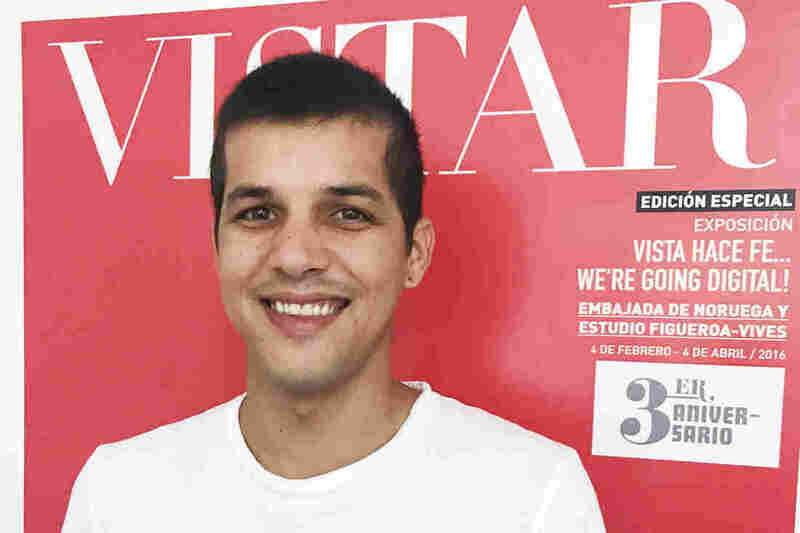 Robin Pedraja just wanted to write about reggaeton and rock and roll when he launched his cultural magazine, Vistar, three years ago. "Everybody told me, hey, you are crazy, the government isn't going to allow you to make this," he says. But in Cuba these days, you are only held back by your own limitations, Pedraja says — though he admits to never publishing anything negative about Cuban culture, a closely controlled state commodity. "I want more. Vistar the magazine is just the beginning ... to build something very big," he says. He says one day, he hopes to gain official press credentials and even start Cuba's first Billboard-like music charts and award shows. Vistar has become profitable as well as popular. While printing a hard copy of a magazine or newspaper other than the official, state-sanctioned dailies is prohibited in Cuba, Pedraja and many other for-profit zines have found another route to readers. He puts a copy every week in El Paquete, The Package — an offline compilation of pirated movies, TV shows and other media favorites that is hand-delivered on USB drives and hard drives around the island for a small fee. It's impossible to know how many read Vistar on El Paquete, since it's not a state-sanctioned media venture, but Pedraja says from comments and emails he receives from Paquete readers, he believes they number in the tens of thousands. Not all blogs can take advantage of El Paquete's distribution, mostly because there is a fee to be included in the weekly offerings, about $25 a week. Cardenas of La Joven Cuba isn't making any money off his blog and refuses to take donations from sponsors or off-island institutions. So he can't afford to include his work in El Paquete. "They have advertisers, they have a whole economic system, and we don't have that," he says. He's negotiating with El Paquete's operators for a lower price. For now, that leaves him copying his blog posts to Facebook, sending them to subscribers on the WhatsApp messaging app — and hoping for the day when Cuba has a faster and more easily accessible Internet.